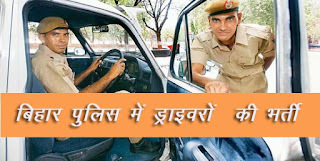 Direct Bharti in Bihar police for the post of Constable Driver under the pay scale 5200-20200 + Grade pay 2000. Intrested candidates can apply from 29.08.2016. Application fees:- Interested candidates need to submit Rs 450 throw using ITM card, Net Banking or Credit card. Candidates who are belong from SC/ST category, need to deposit Rs 112/- only. Educational and other qualification:- Minimum educational qualification is 10+2 pass from recognized board or university and must have valid Driving License. Age limit:- Candidates should be aged between 18 years to 30 years as on 01.08.2016. Age relaxation will be as per applicable as per Indian constitutional rules. How to apply:- Candidates who are intrested must visit official website www.csbc.bih.nic.in and apply online.